Celery Victor, a grand American classic is usually credited to Victor Hertzler, the chef at San Francisco’s St. Francis Hotel at the turn of the 20th Century. Simmering celery hearts in a rich broth, then chilling them in a brisk citrus-and-olive oil marinade elevates their flavor. 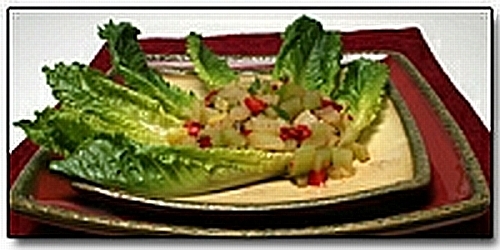 They are then tossed with chopped pimiento or roasted red pepper, dressed with some of the marinade and served on a bed of Romaine lettuce. Our veggie version has been adapted by permission from the AICR (American Institute for Cancer Research). skillet. Cover, and over medium-high heat, bring liquid to a boil. Reduce heat, and simmer 10 minutes. tablespoons of cooking liquid, salt and pepper. Add oil, then celery. broth and reserve for another use. pimientos and combine with celery. top. Sprinkle on parsley and capers, and serve immediately. 8 g carbohydrate, 2 g protein, 3 g dietary fiber, 380 mg sodium.